Download the Official Zoning Maps and Resolution below.The Community Development Department staff members are responsible for implementing West Chester Township's zoning codes. Watch a video on West Chester Township's Community Development Guidelines here. Need to know the zoning of a parcel located in West Chester Township? Click on the "CHECK YOUR ZONING" link below and enter the address, parcel number or owner's name. Click inside the parcel for two pages of detailed information on that property including the zoning designation. When beginning any type of construction or use change, always consider whether a zoning certificate is required. Article 5, Section 5.02 of the West Chester Zoning Resolution requires that a zoning certificate be obtained prior to beginning most construction projects and property use changes. Plan review and issuance of a zoning certificate helps insure that the project conforms to all applicable zoning codes. Please contact Community Development if you are unsure whether your project or change requires a permit. A code enforcement officer can easily answer most preliminary questions. 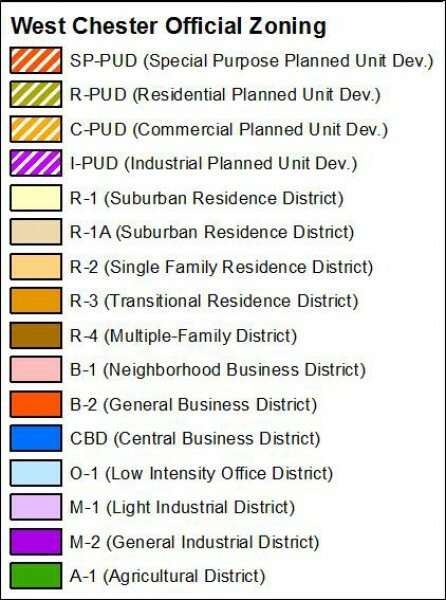 Following is a partial list of common projects and situations for which a zoning certificate is necessary. Once construction is completed, Article 5, Section 5.05 of the West Chester Zoning Resolution requires that a final inspection certificate be obtained before beginning use or occupancy. A code enforcement officer conducts a final inspection to determine that the project was completed according to plan (or use conforms to representation). After inspection and verification of compliance with the Zoning Resolution, a final inspection certificate will be issued. If conditions are not met, however, a final zoning certificate cannot be issued and in such cases, a denial notice will be issued stating the results of the inspection and the requirements necessary to obtain a final. When ready, applicants may call Community Development at 777-4214 to schedule a final inspection by providing the zoning certificate application number, address, and parcel number for the property to be inspected.